In 1976, the staff of the Musée de l’Homme in Paris dismantled an exhibit which had been on show since 1816 and dispatched it to the storage vaults. The macabre display, which consisted of the cast of a woman’s body, her skeleton, pickled brain and genitalia, was all that remained of Saartjie Baartman, better known as the Hottentot Venus, a black woman whose “enormous” hips, “oversized” buttocks and enlarged labia had thrilled and scandalised Georgian London. Baartman had been brought from her home in South Africa to England in 1810 and put on the Piccadilly stage wearing a flesh-coloured leotard, African beads and ostrich feathers. Scientists studied her voluptuous proportions and theorised about the voracious sexual appetites of “savages”, while the public paid a shilling to ogle and hurl obscenities at her. The display of Baartman was one of the earliest and most famous examples of a phenomenon that became known as the “human zoo”. Nineteenth-century Britain was fascinated by the strange and the exotic. 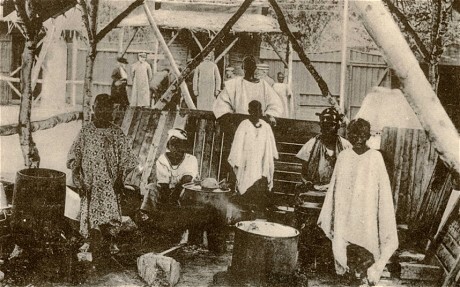 Human zoos, which displayed people from far-flung corners of the globe in a “natural” or “primitive” state, became a popular form of mass entertainment. These ethnographic exhibits grew out of menageries and the cabinets of curiosities that flourished throughout Europe from the end of the Renaissance. They can be traced back through 16th-century royal courts to ancient Egypt, where black “dwarves” were exhibited from the Sudan. But it was during the age of imperialism that this new form of entertainment took hold. Like many people, I had never heard of human zoos until I came across a black-and-white photograph of a group of tribespeople wearing loincloths, sitting around a campfire in a fenced-off enclosure, watched by white-skinned men in formal suits and bowler hats. This chance discovery led me to write The Lost Tribe of Coney Island, which tells the incredible true story of the Bontoc Igorrotes, who, in 1905, were taken from their homes in a remote, mountainous region of the northern Philippines to America. There they were put on show at Coney Island and billed as “head-hunting, dog-eating savages”. The Igorrotes (as they were known in America) met the president’s daughter, were studied by anthropologists, and courted by Broadway stars. Americans wanted to save them – visitors brought them clothes, offered to adopt them, and donated money to send the children to school. Meanwhile the government, which had recently colonised the Philippines, hoped to drum up popular support for its policies by showing the American people that the “savages” were far from ready for self-government. The Igorrotes’ story ended with a court case and public scandal after their ill-treatment and shameful exploitation by their American manager became known. But the Igorrote show trade continued for a decade, with tours to London, Edinburgh, Paris, Ghent and Cuba, before the US government eventually intervened, in 1914, and banned the exhibition of Filipino tribespeople. The appeal of human zoos extended to every level of society, from ordinary working men and women to the aristocracy. In the US, the showman P T Barnum created the Grand Congress of Nations in 1884, presenting “strange and savage” tribes, including “ferocious” Zulus, Sioux Indians, a “savage” Muslim, a group of Australian Aborigines and a Nubian. Barnum spawned hundreds of imitators and toured extensively around Europe. But it was London that emerged as the capital of the human zoo, playing host at international exhibitions, fairs and carnivals to troupes of Guyanese, Zulus, groups from Ceylon, along with Sami, Native Americans, Inuit, Bushmen, and Fuegians. In 1859 Charles Dickens saw a display of Zulus in London and was so inspired he wrote a pamphlet about them. The growing popularity of human zoos in the second half of the 19th century led to the emergence of a new breed of showmen who toured Africa, Asia and other distant lands looking for novel and exotic human attractions. Sometimes the people they brought back were exhibited alongside animals and “freaks” – from the bearded lady to Siamese twins. Others were displayed in mocked up tribal villages, where they lived in tents and huts, surrounded by “indigenous artefacts” – spears, shields, cooking pots and tribal masks. As audiences grew more demanding, the human exhibits were pressed into performing native dances and religious rituals. They gave demonstrations – weaving tribal garments, cooking “authentic” dishes, and holding sham battles. Some gave birth on tour, others were married in staged events designed to drive up visitor numbers. They were often required to wear little more than strips of cloth to satisfy the curiosity of their visitors with an “authentic” flash of dark flesh. Some troupes toured for years. Their appeal was not purely commercial. Anthropologists and scientists flocked to the villages to observe their exotic inhabitants. They studied their customs and language, took measurements of their bodies, heads and facial features. These statistics were then used to back up theories about the racial superiority of the white man. But as time passed, scientists began to distance themselves from the ethnographic exhibits, due to increasing concerns over the commercialism and sensationalism of the shows. Some of the human exhibits were coerced into appearing or even kidnapped. Others agreed to go on tour in return for a wage. As the trade grew, local middle men began working as recruiters. They negotiated terms on behalf of the “exotic peoples”, drew up contracts for them to sign and took a cut of the profits. Sometimes the human exhibits were treated cruelly, and kept as virtual prisoners in cages or behind wire fences, where they were poorly fed and housed in inadequate accommodation which did little to keep out the cold. There were health scares and epidemics, most famously an outbreak of smallpox among some of the human exhibits at the 1893 Chicago World’s Fair. There were deaths and suicides, and stories of scientists being allowed to conduct experiments on the dead. One of the most heart-rending stories is that of Ota Benga, a young boy from the Congo who was displayed in the monkey house at the Bronx Zoo in 1906. Benga was described in the press as “a dwarfy, black specimen of sad-eyed humanity”. His teeth had been sharpened to points and Americans came in their hundreds of thousands to see him. He posed with them for photographs for 25 cents. A public outcry led to Benga being released from his cage and transferred to an orphanage. Eager to feel at home in America, the adult Benga had his sharpened teeth capped, and began to study English. He moved to Virginia, where, despite his eagerness to be accepted by his new neighbours, he continued to be treated as an oddity. His life ended in tragedy – in 1916 he removed the caps from his sharpened teeth before shooting himself in the head. He died aged 32. Most visitors to human zoos looked on with appreciative fascination. There was, however, a vocal minority who objected to the degrading displays. They included anti-slavery groups, intellectuals, religious groups and, in America, the Anti-Imperialist League. The case of Baartman was taken up by abolitionists in London who tried, and failed, to have her freed. By the Thirties, human zoos had fallen out of fashion, replaced by other forms of mass entertainment such as television and cinema. As for Baartman, she was sold to a showman in France, where she began to drink heavily and died in December 1815. Even in death, she did not find peace: Napoleon’s surgeon, Georges Cuvier, carved up her body before displaying bits of it in the Paris museum. 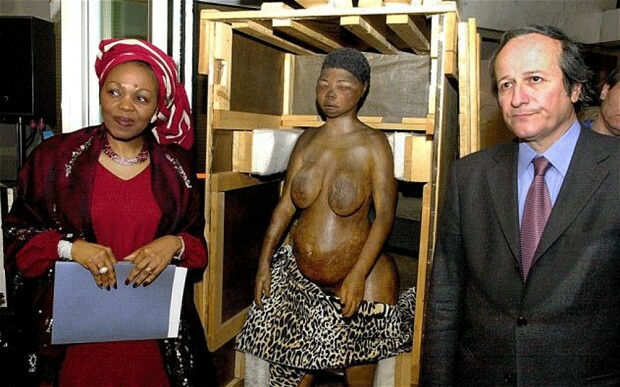 In 2002 her remains were taken back to South Africa and given a ceremonial burial. It marked the belated end of the trade in human exhibits. Today we are intrigued by the thought that such displays were once thought acceptable. Artists Lars Cuzner and Mohamed Ali Fadlabi recently reconstructed Norway’s Congo village from 1914 as an art installation, using volunteers from around the world. And Exhibit B, a piece at this year’s Edinburgh Festival, presents 12 tableaux vivants, each featuring motionless, nearly naked African performers placed in settings inspired by real people and events. Attitudes have changed, but the fascination with this bizarre episode of human history remains.